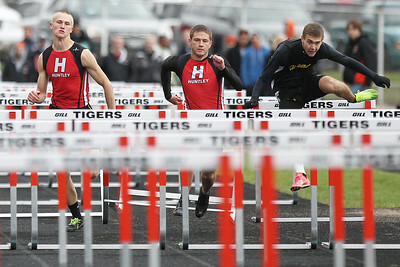 Mike Greene - mgreene@shawmedia.com Huntley's Jake Brock (left) and Chase Hellinger race with Harvard's Nathan Baldwin in the boys 110 meter high hurdles final during the McHenry County Track & Field Meet Friday, April 20, 2012 in Crystal Lake. 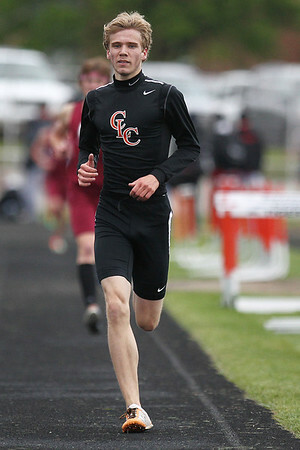 Huntley's Chase Hellinger took first place in the event. 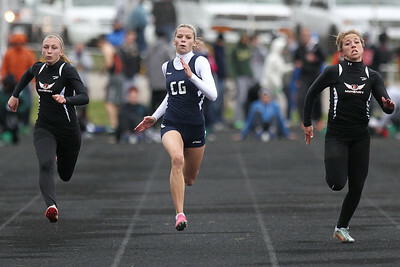 Mike Greene - mgreene@shawmedia.com Cary-Grove's Sarah Ryan (center) races in the girls 100 meter dash final during the McHenry County Track & Field Meet Friday, April 20, 2012 in Crystal Lake. Ryan took first place in the event. 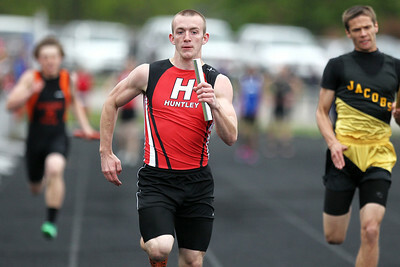 Mike Greene - mgreene@shawmedia.com Huntley's James Davis runs the last leg of the boys 4x100 meter relay final during the McHenry County Track & Field Meet Friday, April 20, 2012 in Crystal Lake. Mike Greene - mgreene@shawmedia.com Crystal Lake Central's Sammi Staples runs in front of the group while competing in the girls 3200 meter run finals during the McHenry County Track & Field Meet Friday, April 20, 2012 in Crystal Lake. Staples took first place in the event. 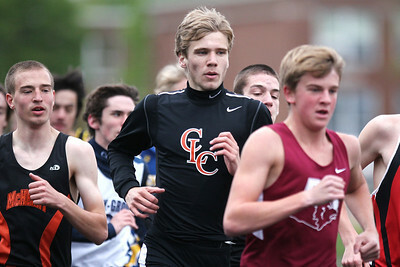 Mike Greene - mgreene@shawmedia.com Crystal Lake Central's Alex Baker (center) runs in the middle of the pack early in the boys 3200 meter run final during the McHenry County Track & Field Meet Friday, April 20, 2012 in Crystal Lake. Baker would take first place in the event. 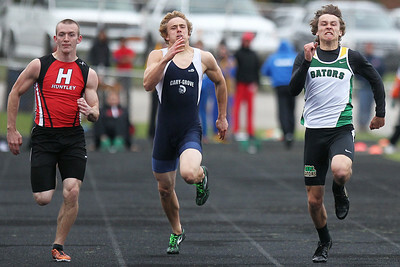 Mike Greene - mgreene@shawmedia.com Huntley's James Davis, Cary-Groves Tommy Rohn, and Crystal Lake South's Zane Boettcher compete in the boys 100 meter dash finals during the McHenry County Track & Field Meet Friday, April 20, 2012 in Crystal Lake. Crystal Lake South's Zane Boettcher took first place in the event. Mike Greene - mgreene@shawmedia.com Crystal Lake Central's Alex Baker breaks away from the pack while competing in the boys 3200 meter run finals during the McHenry County Track & Field Meet Friday, April 20, 2012 in Crystal Lake. Baker would take first place in the event. 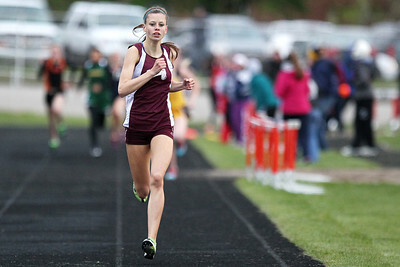 Mike Greene - mgreene@shawmedia.com Marengo's Allie Sprague runs in front of the group in the girls 800 meter final during the McHenry County Track & Field Meet Friday, April 20, 2012 in Crystal Lake. Sprague took first place in the event. 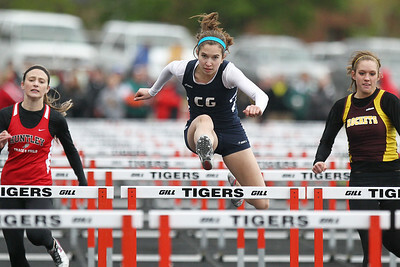 Mike Greene - mgreene@shawmedia.com Cary-Grove's Kathie Wollney jumps over a hurdle in the girls 100 meter hurdles finals during the McHenry County Track & Field Meet Friday, April 20, 2012 in Crystal Lake. 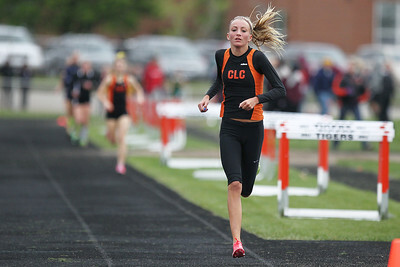 Crystal Lake Central's Sammi Staples runs in front of the group while competing in the girls 3200 meter run finals during the McHenry County Track & Field Meet Friday, April 20, 2012 in Crystal Lake. Staples took first place in the event.